Sweden’s first and only interactive dark ride is described as a competitive ghost-hunting adventure by Furuvik. The park, which is an amalgamation of a zoo, theme park, and concert venue, is two years into a refurbishment project – the jewel of which is Spökjakten, set to open its doors on May 19. Six wagons each ferry four riders through 11 interactive scenes, and the aim of the game is to use the laser pistols and shoot ghosts, ghouls, and other spooks, scoring as many points as possible – or at least more than the person next to you. Dark rides have become an increasingly popular option for park owners with limited space or budget, and Spökjakten follows another rising trend that favors the refurbishment of existing buildings to the construction of entirely new ones. “[The Spökjakten site] has always been a popular attraction among our guests but it needed an update,” Furuvik Park tells Park World. Updates have been the name of the game at Furuvik in the last few years, with new attractions such as Small Frogs and Gungan, and now the most recent roller coaster, Fireball, added prior to Spökjakten’s reveal. The building that houses Spökjakten has been completely transformed, inside and out, with the castle becoming a landmark that dominates the landscape of the park. Created in partnership with Sally Corporation, Spökjakten tells the story of Professor Finkelstein, who recruits riders to help him send the wicked Boocifer and his spirited minions back to the other side of the grave. The ride boasts a competitive edge with heaps of replay value, and even the atmospheric queue lines contain “a few surprises”. 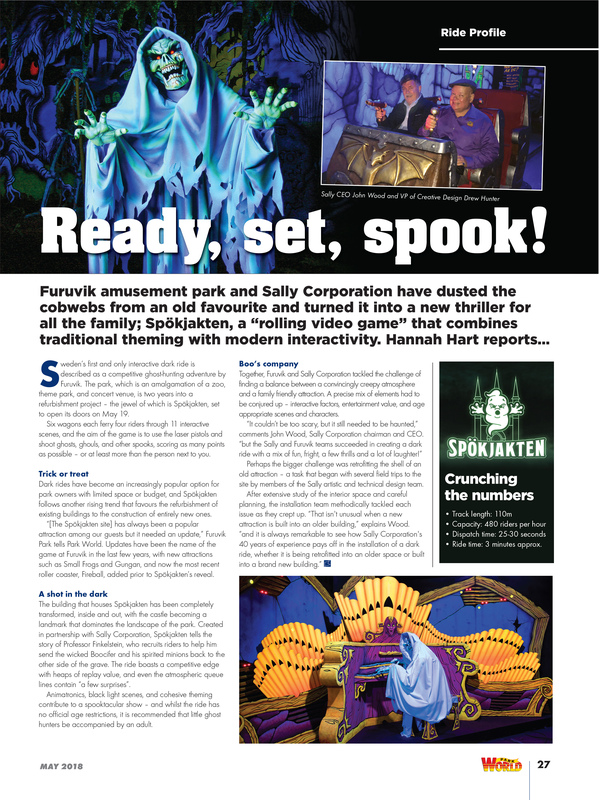 Animatronics, black light scenes, and cohesive theming contribute to a spooktacular show – and whilst the ride has no official age restrictions, it is recommended that little ghost hunters be accompanied by an adult.